I've posted before about how Zach & I take home decorating seriously. It's kind of funny that I've found someone so polar opposite of me when it comes to that kind of stuff. Aren't boys not supposed to care?? Anyway, after we've gone through a lot of Pinterest boards & sort of come to a conclusion and I feel much better. For a Friend - Share your color love with out being too invasive in their own style with a candle or other sort of home decor item like that. It's not to invasive & you're getting your color crush out there! For your Home - If you're like me & you have a man to worry about, picking a color crush that goes great with a neutral is a must. By throwing these pink pillows in ombre shades with gray you'll add a punch of color to your otherwise drab neutral palette. If your guy even cares, that is! Coral tones may be a good step into pink if you feel others in your household may not be into the pink. For You - Show your pink pride on you hand with a bright ring or nail polish. I mentioned in the Style Something Blue post, that a good way to incorporate a color you are crazy about into your wardrobe is through nail polish or a ring. This way it's subtle but lets you test out how the color plays with your wardrobe, skin tone, etc. You'll get used to seeing how the color looks on you & you'll feel comfortable in a bright pink blouse! This advice works for more colors than just pink! If you're into adding a pop of color into your life, try these tips with any color under the sun. The trick to including bright colors or colors outside of your comfort zone is to do it in moderation. Throw in a hint here & there until you get used to the color. You won't overwhelm yourself or drop a lot of dough on something you may grow to hate! How do you take a step outside your comfort zone with color? 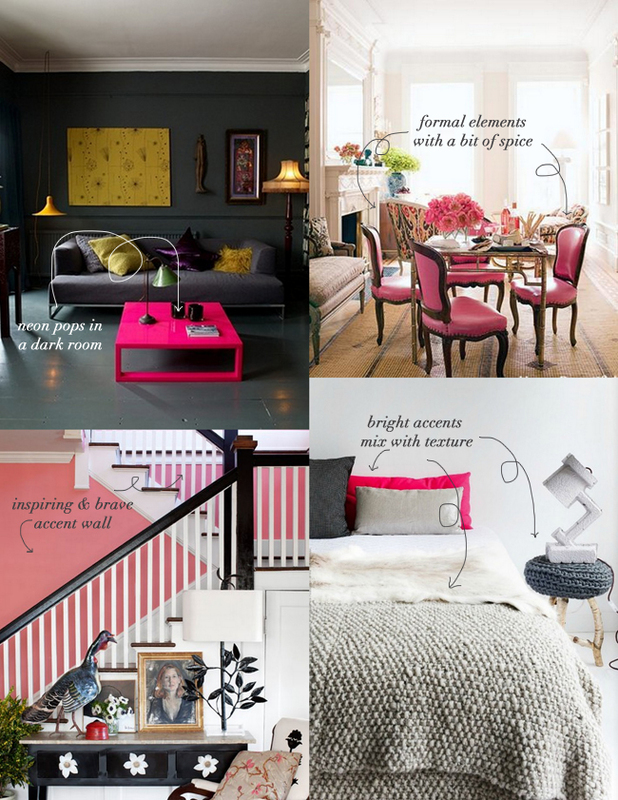 That photo with the bright pink table is my new obsession - thanks for sharing! Absolutely obsession over that pink table as well...Pinning immediately!